Home / What Are Gravitational Waves? 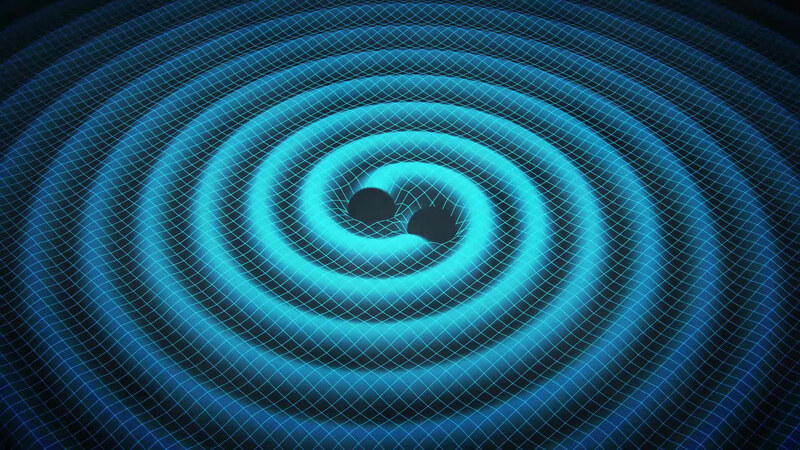 Gravitational waves are ripples in spacetime that travel at the speed of light. Albert Einstein first predicted them in 1918, as a consequence of his theory of General Relativity published in 1915. After more than 50 years of experimental challenges during which the gravitational waves remain elusive, they have finally been detected on Earth a century later, on 14th September 2015. What are these mysterious waves and why is it so difficult to detect them? As their name suggests, gravitational waves are a consequence of gravitation. 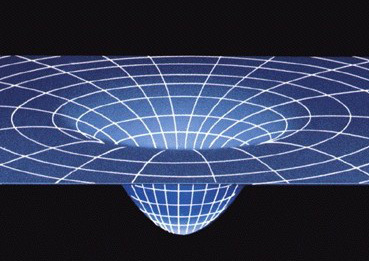 In General Relativity, gravity can be interpreted a consequence of the shape of spacetime. In fact, Einstein’s equations state that the presence of a massive body deforms the spacetime around it. We can imagine the fabric of spacetime as a rubber sheet. When we place a sphere on it, the sheet will be deformed, and everything moving on it will follow this curvature. Artist’s impression of spacetime curved by a massive body. The same happens with spacetime: a test mass passing close to a massive object, will follow the curvature of the spacetime around the massive object, which we observe as the “attractive” force we refer to as gravity. Light travels in straight lines in flat spacetime, but close to a massive object light will also follows the curvature of the spacetime around the massive object. As a consequence, it looks like the light is also “attracted” toward the massive object. This is not easy to imagine, because we are living in this same spacetime. However, we can measure such curvature, by looking for instance at the deviation of the path of light coming from faraway stars that are close to the Sun in our view of the sky. This deflection of the light coming from stars behind the Sun was observed for the first time in 1919 during a solar eclipse, providing one of the first tests of the General Relativity. Artist’s impression of a gravitational wave. In this example, spacetime is perturbed by the motion of two black holes rotating around each other ( Credits: Swinburne Astronomy Productions). Gravitational waves appear when some event perturbs the curvature of spacetime. We can think of a drop falling in a pond. It perturbs the water surface, and this perturbation propagates outwards in the water as a mechanical wave. In a similar way, when spacetime is perturbed, gravitational waves are generated and they propagate outwards at the speed of light (~300000 km/s). What events can induce these perturbations in the fabric of spacetime? In principle, any asymmetric motion of mass could generate a gravitational wave. We can think of it as a “spacetime quake”. For instance, this happens when two black holes or neutron stars are orbiting quickly around each other, or during the Big Bang, the event that gave birth to our Universe. Rotating neutron stars or stellar explosions like supernovae may also emit gravitational waves, as well as other unknown phenomena that future detectors will discover. Only the most powerful of these events may emit gravitational waves powerful enough to be detected on Earth. In fact, gravity is an extremely faint force, and as a consequence the effects of gravitational waves are very small and difficult to detect. On Earth, the passage of a gravitational wave will alternatively stretch and squeeze the distance between two objects, in a different way along two perpendicular directions. Detectors like Advanced Virgo will experience the lengths of its two arms oscillate, at the same frequency of the incoming gravitational wave. However, this effect is very tiny. As an example, the gravitational wave generated by the merging of two neutron stars in a galaxy close to ours will stretch the distance Earth-Sun (150 million of km) by the size of an atom. Detecting such tiny distance variations is a big challenge and is the main goal of an instrument like Virgo. Deformation of the spacetime between a ring of test masses induced by the passage of a gravitational wave. Here the effect is widely magnified to show the phenomenon. The study of gravitational waves will provide us with a deeper insight on these extreme phenomena, and help us to probe the laws of gravitation. More and more gravitational wave signals will be clearly detected in the coming years by the advanced generation of gravitational observatories like Advanced Virgo and Advanced LIGO, opening a new era in the study of the cosmos.